http://www.doorsteplondon.com/wp-content/uploads/2016/01/MG_9831.png 686 1030 [email protected] /wp-content/uploads/2016/03/logo-6.png [email protected]2016-03-12 12:25:582016-03-12 12:26:48Boat trip and birthday! We are grateful for London Community Foundation‘s recent feature on Doorstep, helping to draw attention to our cause and work. Tanya is waiting for the phone call that she hopes will change her life. A single mother with a two-year-old son, she’s spent the last nine months living in a hostel for homeless families. There’s no space for her boy, Omran, to play and barely any privacy. The strain of living in such cramped accommodation is taking its toll. Tanya looks smart in her dark trousers, green and cream sweater, black hair tied back. But she speaks in a whisper and spends much of our time together with her head in her hands. She’s desperate to find a safe, permanent home for Omran. Last month her dream came true. 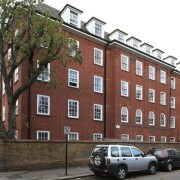 Camden Council found a private landlord willing to rent a flat to a tenant on housing benefit. Moving day is next week. But two days ago the dream turned sour. Tanya heard that the landlord still hadn’t signed the contract. Now he isn’t answering his phone. And her housing officer is off sick. Tanya is telling her story in the crèche at Doorstep Homeless Families, a shoestring charity that’s a lifeline for people like Omran and herself. Many of the 45 families living on the four floors above have just one room. Others get two, but with a communal corridor running between them. People often feel isolated, cut off from family and support networks. They may have fled violence and experienced trauma. Vicky Fox runs Doorstep, and has worked here for 25 years. She’s the only full-time staffer. Christmas is two weeks away. Today there are two parties for children and their families; sacks of presents to wrap; food hampers to distribute. Her cramped office has a desk, a sink, mountains of paperwork and Post-it notes everywhere. “It’s a huge workload,” she says. Fundraising is a growing part of the job. Camden provided the core funding for 20 years. But in 2014 they cut 100% of their grant. “It was a blow,” says Vicky. “Doorstep has been a rock for me these last nine months,” says Tanya. Here Omran can be a normal, smiley kid. With his black hair cut short, in a dinosaur t-shirt, he’s happy playing trains and cars on the floor with another boy his age. He’s oblivious to his mum’s tears, as she explains how they became homeless. Born in northern Iraq, Tanya grew up in Baghdad. Her father was a doctor. They fled the country when he was detained and tortured by the regime. With the help of the United Nations, they made it to London in 2001, as refugees with indefinite leave to remain. From very little, Tanya built a good enough life for herself: a rented three-bedroom flat, a car, some savings in the bank. She’s an educated woman with two university degrees. When her father had a stroke, Tanya was his sole carer until he died. She then met a man, married him within a year, and had a baby. Her husband decided they would live in Germany, where he had family and work would be easier to find. But when they arrived he just sat on the sofa all day playing computer games, says Tanya. Once her savings were all gone, he abandoned her. Eventually, she made it back to London, arriving at St Pancras train station with one suitcase, Omran in his buggy and nowhere to sleep that night. 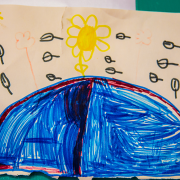 Tanya went to Camden town hall and declared herself homeless. The phone call she’s desperately waiting for isn’t just about getting a proper home; it’s the first step away from this life and back towards normality. The thought that it might fall through is almost too much to bear. She’s taking medication for depression, and was considered a suicide risk. Vicky has been watching her closely. Omran’s crying interrupts us. Another child has banged him on the head with a toy. He comes to Tanya for a cuddle. “Ah, mummy, mummy, mummy,” she says, embracing him in a long hug, kissing the top of his head, again and again. Now the morning play session has finished. Tanya’s phone hasn’t rung. We wish her good luck as she climbs the stairs to street level. She’s off to find another way to pass the time, before it gets too dark or too cold and they have to return to the hostel. Christmas comes and goes. Did the landlord sign the contract? Are they still stuck in that single hostel room? There’s no news about Tanya. 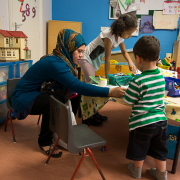 Doorstep Homeless Families Project is funded by the London Community Foundation. There’s more information about the project here: http://www.doorsteplondon.org Some of the names in this story have been changed to respect privacy. http://www.doorsteplondon.com/wp-content/uploads/2016/03/5cae88f3-3b95-48ba-af99-d20f22230683-1020x659.jpeg 659 1020 [email protected] /wp-content/uploads/2016/03/logo-6.png [email protected]com2016-03-01 19:58:512016-03-05 13:34:12A must-read on homelessness - "No exit: Britain’s social housing trap"